Several types of downhill flow features have been observed on Mars. This image from NASA's Mars Reconnaissance Orbiter is an example of a type called "linear gullies." 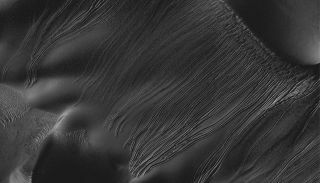 Some gullies scoring the sides of Martian sand dunes were likely carved by frozen chunks of carbon dioxide, also known as dry ice, a new study finds. "I have always dreamed of going to Mars," lead author Serina Diniega, of NASA's Jet Propulsion Laboratory in Pasadena, Calif., said in a statement. "Now I dream of snowboarding down a Martian sand dune on a block of dry ice." "In debris flows, you have water carrying sediment downhill, and the material eroded from the top is carried to the bottom and deposited as a fan-shaped apron," Diniega said. "In the linear gullies, you're not transporting material. You're carving out a groove, pushing material to the sides." After studying images of these features taken by NASA's Mars Reconnaissance Orbiter (MRO), the team determined that they form during the early Martian spring on dunes that spend the winter covered by carbon dioxide frost. These images from NASA's Mars Reconnaissance Orbiter show linear gullies on a dune in Matara Crater at different times of year. The top image is from Mars' southern-hemisphere early summer, while the bottom two are from spring nearly two Martian years later. The white arrow in the middle image points out a bright CO2 frost block that is apparently carving out a new gully. To test this theory out, the team took some dry ice out to dunes in California and Utah. The blocks slid down the slopes, creating features similar to the Red Planet's linear gullies. "MRO is showing that Mars is a very active planet," said co-author Candice Hansen of the Planetary Science Institute in Tucson, Ariz. "Some of the processes we see on Mars are like processes on Earth, but this one is in the category of uniquely Martian." There are many different types of gullies on Mars, and scientists think some of them — such as features called recurring slope lineae — may be formed by the action of flowing water. The new study doesn't speak to water's potential role in any of these other features, Hansen said. "Just because this dry-ice hypothesis looks like a good explanation for one type doesn't mean it applies to others," she said. The new study has been published online in the journal Icarus.